There are few things Dallas Cowboys fans enjoy more than watching Ezekiel Elliott play football. Few NFL players are more dynamic with the ball in their hands, so it's no surprise that Dallas features Zeke heavily in the offense. But could that heavy workload hurt Elliott's career in the long run? 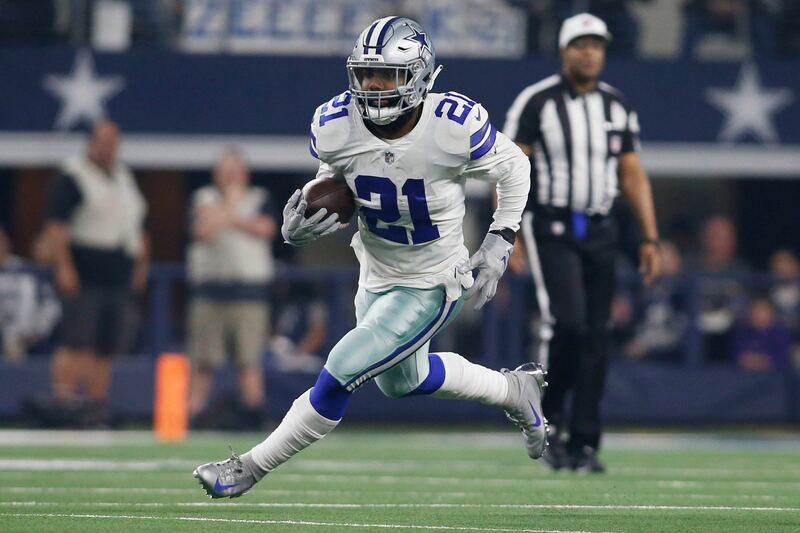 After 11 weeks of the 2018 season, Zeke leads all running backs with 217 carries. The next closest is the Rams' Todd Gurley with 210 carries, and then Pittsburgh's James Conner at 186. Elliott also has the most catches on the Cowboys at 47, with Cole Beasley right behind him at 46 receptions. That's a total of 264 touches already for Zeke with five games still to go, which computes to about 384 touches by the end of the year. That's a lot for the modern NFL running back. In 15 games last year while winning the Offensive Player of the Year award, Todd Gurley had 343 combined runs and receptions. The history of RBs tells us that years of high volume in touches eventually take a toll. Sometimes, the drop-off comes very quickly. Perhaps the most famous example is former Chiefs' great Larry Johnson. In 2006, Johnson had 416 carries and 66 catches. The next season, Larry only played 8 games and never looked like the same player again the rest of his career. Granted, that was 12 years ago. Sports science has developed since then and allows for better recovery from injuries and better overall understanding of physical preservation and development. But just last year, we saw Arizona's David Johnson lose an entire season after a huge workload the year before. In 2016, Johnson had 293 carries and 80 catches for the Cardinals. The next year, he didn't even make it out of Week One without suffering a season-ending injury. Coincidence? Maybe, but there are more than enough examples that you can't just ignore the potential effect on Elliott. As many times as Zeke leaves defenders in his dust, he also doesn't run away from contact. One of Elliott's best qualities is his willingness to grind out tough yards, turning 2-3 yard runs into 4-5 yarders with pure grit. We love that about him, but it also increases his wear and tear. It makes those many touches, on average, tougher on his physically than some other running backs. This may seem a silly topic when we're discussing a 23-year-old. Comparatively, Larry Johnson was 27 and David was 26 when they had their bad years. But in the very near future, Dallas will have to make a big decision a bout Zeke's long-term value. His rookie deal expires after the 2019 season. Because Elliott was a first-round pick, Dallas will have a fifth-year option for 2020. Based on recent trends and projections, that amount should be around $9-$10 million for a running back. The Cowboys should be happy to pay that for one year of Zeke's services, assuming he's still an elite performer at that time. He'll still be just 25 that season. But beyond that, when it's time to start thinking about a long-term deal, what will all of the touches from 2016-2020 mean for Elliott's future? We look at football players a lot like we do automobiles. Age is one factor, but mileage is another. How much stock you put in one number over the other really comes down to personal preference and guesswork, because the ultimate answer is as individual as each make and model. Sadly, football players longevity and physical reliability is even less predictable than cars. If Ezekiel Elliott still looks as healthy and spry as ever over the next few years, the Cowboys may have enough confidence to make him an extended deal. They would likely structure the contract to give themselves a good out once he gets closer to 30, in case things do go south. It is worth remembering, though, what happened between Dallas and DeMarco Murray just a few seasons ago. In 2015, a year before Dallas drafted Elliott, Murray was coming off a historic year for Cowboys running backs. He'd rushed for 1,845 yards in 2014 and broken Emmitt Smith's record for a single season. But also that year, Murray had 392 carries and 57 catches. Between that heavy workload and an inconsistent track record before 2014, Dallas elected not to pay DeMarco like a top NFL running back. He walked away in free agency, getting an attractive deal from the Eagles. Murray's one year in Philly was a bust, and the curse of the high number of touches the year before was validated once more. DeMarco had trouble staying healthy and didn't look like the same guy, regardless of the switch in offensive schemes. Even though Murray had a solid 2016 year for the Titans, he never looked like the stud we saw in that last year with Dallas. The Cowboys were proven right for not making the long-term investment. Assuming decision time on Ezekiel Elliott comes in 2021, after the rookie deal and 5th-year option season, then Zeke will be just a year younger than Murray was when Dallas let him walk. And he'll have had a lot more touches over those five years than DeMarco had to begin his NFL Career. Could the Cowboys play hardball again? Would they be willing let Zeke walk, happy with the 4-5 elite years they got out of their first-round pick, and then draft his replacement? That decision isn't upon them today, but every carry and catch between now and then could impact what they choose to do. It makes Elliott's ongoing workload worth monitoring as his Cowboys career continues.